Life is busy. Real busy. And now you find out that you have a tooth that needs a crown. How in the world are you going to fit two more dentist appointments in your schedule? You’re not, because Dr. Tillman can provide you with a crown in just one visit. With CEREC, we can manufacture and place a crown right here in our Fort Worth dental office. CEREC—Chairside Economical Restoration of Esthetic Ceramics or CEramic REConstruction—is an advanced dental technology that allows dentists to design, build and set a crown in just a few hours from start to finish. The system consists of a digital camera to take a clear picture of a tooth that needs repair; a computer with special software that converts the picture into a design for your dental crown; and a milling unit that carves the crown from a single block of porcelain. If you’ve previously had a standard crown placed, then you may recall having the tooth prepared and a temporary set at the first visit and then returning to your dentist to have the process completed with the permanent restoration at a second visit. 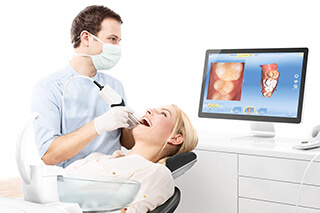 CEREC conveniently condenses those steps into just one appointment. And with CEREC, you aren’t bothered with having to take a molded impression. 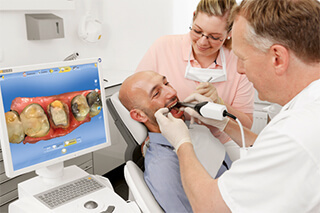 CEREC’s camera and computer software take care of that instead. Dr. Tillman may recommend a dental crown to repair a tooth that is decayed to the point that a filling would not be sufficient or to protect a tooth that is deeply cracked or otherwise damaged. If we find that your tooth needs a crown, then CEREC may be the ideal treatment choice. 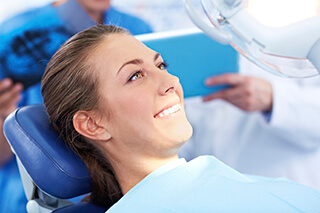 As with a traditional crown, Dr. Tillman will need to prepare the tooth by carefully removing decay if there is any as well as some of the tooth’s natural structure. This is done to ensure that the crown fits evenly between the adjacent teeth and against your opposing teeth—we don’t want the crown to feel too high when you bite down. Then, the CEREC system gets to work. 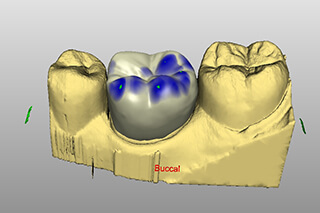 The digital image of your tooth is input into the computer where CEREC’s 3D CAD/CAM software designs your crown. The design incorporates the precise color, shape and size of the crown. This design is then sent to our milling unit that will fabricate your new dental crown in less than 20 minutes. When completed, Dr. Tillman examines the crown and double-checks the fit. Finally, the crown is bonded over your prepared tooth. For more information about CEREC or any of our other restorative services, please contact the Fort Worth dental office of Dr. Tillman.